A soft and chewy brownie made into a cupcake and topped with homemade chocolate frosting. These cupcakes taste just like a brownie and have a crunch with a soft center just like one, too! These brownie cupcakes are topped with a homemade chocolate frosting that really throws the brownies over the top in flavor! 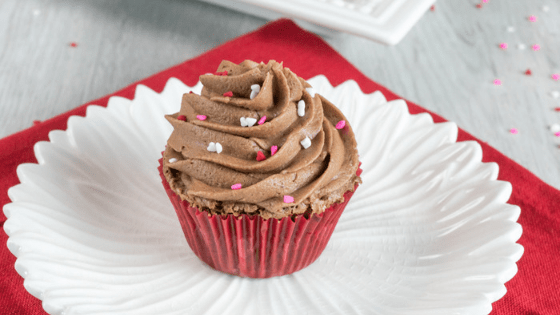 These brownies cupcakes make a sweet treat for Valentine’s Day or for any other Holiday for that matter. By switching out the cupcake liners and with an endless option of sprinkles to choose from, you can make them for any occasion! When making these brownie cupcakes it’s super important not to open the oven and peek in to check the progress. They have a really soft center so by opening the oven it changes the temperature inside the oven. (Yes, even just a peek!) Resist the urge to check on these cupcakes until the baking time is complete! If you do sneak a peek, the centers of the cupcakes will fall in. They’ll still taste good, just won’t be level! Soft and Chewy brownie made into a cupcake and topped with chocolate frosting. Using a double boiler, melt the chocolate chips and set aside. Preheat oven to 325° and place 24 liners in muffin pans. In a large bowl, cream together the butter and white sugar. Add in one egg at a time, do not overbeat. Add in vanilla and salt. Add in the cocoa and flour. Stir in the melted chocolate, making sure not to over mix. Fill the liners 1/2 full and bake for about 25-30 minutes. Beat together the softened butter and the cocoa powder on low. Add in half of the powdered sugar and 1/4 cup of the milk. Add in the rest of the powdered sugar and continue adding the milk until desired consistency.